For a while I’ve been trying to find a tiling of a figure with 5-fold symmetry using just the pentapennies. It feels like it should be doable, but I haven’t had any luck so far. Maybe you will? Call that problem #27. As with the polycircles in my last post, I decided to stack the deck in my favor by adding smaller pieces to the tiling set. 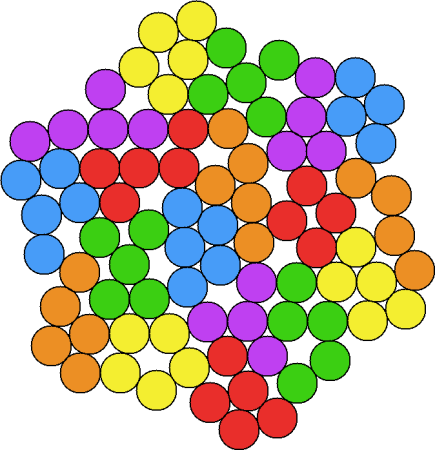 This tiling contains 85 pennies: 65 from the 13 pentapennies and 20 from the five tetrapennies. With polypenny tilings you can either use a pattern with a penny in the center, or you can leave the center open. With a penny in the center, the remaining number of pennies is divisible by six. This is nice not only because we get a little more symmetry, but also because the configuration of six pennies around the central penny is strongly connected, which means that we have more flexibility in where the polypennies can go in that region. Unfortunately, although seven is also a divisor of 84, seven pennies don’t fit around a central penny, so this is probably as good as we can do for symmetry. Although if we went to hyperbolic geometry, seven pennies could fit perfectly around a central penny after all. But, for now at least, I’ll save my pennies and not spend them irresponsibly at non-Euclidean exchange rates.